Are you looking for mellow relaxing acoustic music for your event? 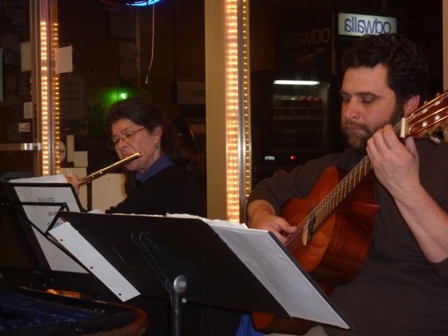 We are a flute/guitar duo that performs an eclectic mix of classical and world music, including Brazilian, and Latin American. We perform at weddings, parties, cafes, restaurants, art galleries etc. Thank you Tom and Francisca!! I hired Tom and Francisca to play music at my outdoor June wedding and they were fantastic! They were so great to work with, a few of the songs that I requested were already on thier playlist, so that wasn't a problem. I had one song that I had always envisioned walking down the aisle to - they found it and took the time to learn it. Tom even sent me samples of them rehearsing it. It turned out beautifully and I couldn't have been happier. They continued to play beautiful music through the cocktail hour, which my guests loved. I highly recommend Tom and Francisca. Francisca plays flute, alto flute, South American pan pipes, and quena. She began playing at the age of 13 guided by her grandmother, world renowned harpsichordist, Alice Ehlers. She later studied with Roger Stevens in Los Angeles and at the Mozarteum in Salzburg, Austria. While living in London, she attended a week-long master class with flute great, James Galway. Francisca also performed in Austria and London with various guitarists and in Spain with the Pepe Million Trio. Upon returning to the United States, she toured the US, Canada and South America with SF Bay Area based Nueva Cancin band, Grupo Raiz, with whom she appeared at the New Song Festival in Quito, Ecuador, and with Chilean singer, Capri Hidalgo, at the Alianza Francesa in Quito. She also performed in Peru with Nayo Ulloa and Mariposa, and the Peruvian band, Polen, at various venues in Peru. Francisca recorded and toured with Sabia, a Los Angeles based Nueva Cancin band, appearing on the album, ‘Portavoz’ which featured her composition ‘Por el Camino de la Niebla’. She has shared the stage with Inti-Illimani, Pete Seeger, Holly Near and Bonnie Raitt. She currently performs with the Daly City Allstars Wind Ensemble, as primary flutist with the Aurora Mandolin Orchestra, and with classical guitarist, Tom Romero. Tom Romero is a music teacher at Kehillah’s Jewish High School in Palo Alto, California. Tom is an active musician who has been teaching guitar in the wider San Francisco Bay Area for over 15 years. He has a B.A. in music from California Sate University, Long Beach, where he studied classical guitar with Kurt Schuster. Tom received his teaching credential and Masters of Arts Degree in Music Teaching from Notre Dame University in Belmont, CA where he studied classical guitar with Richard Patterson. Tom has composed original music for short films and documentaries, and he currently performs with the Aurora Mandolin Orchestra/Ensemble, and the Silver Strings Ensemble, and flutist, Francisca Wentworth. 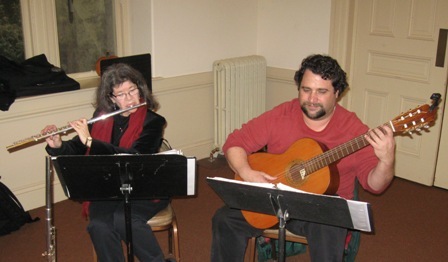 Francisca and Tom have been performing together around the San Francisco Bay Area since 2010.